A study published in the online journal PLoS One reveals that dogs are better then chimpanzees at interpreting pointing gestures. When someone points at an object, the dog knows what it means better than a chimp. Chimpanzees on the other hand failed in the object-task experiments of the study. "The Chimpanzees routinely follow the gaze of humans to outside targets. But in most other studies using object choice, they fail to use communicative gestures (e.g. pointing) to find hidden food. Chimpanzees’ failure to do this may be due to several difficulties with this paradigm. They may, for example, misinterpret the gesture as referring to the opaque cup instead of the hidden food. Or perhaps they do not understand informative communicative intentions. In contrast, dogs seem to be skilful in using human communicative cues in the context of finding food, but as of yet there is not much data showing whether they also use pointing in the context of finding non-food objects. Here we directly compare chimpanzees’ (N = 20) and dogs’ (N = 32) skills in using a communicative gesture directed at a visible object out of reach of the human but within reach of the subject. Pairs of objects were placed in view of and behind the subjects. The task was to retrieve the object the experimenter wanted. To indicate which one she desired, the experimenter pointed imperatively to it and directly rewarded the subject for handing over the correct one. While dogs performed well on this task, chimpanzees failed to identify the referent. Implications for great apes’ and dogs’ understanding of human communicative intentions are discussed..."
Katharina Kirchhofer, of the Max Planck Institute for Evolutionary Anthropology in Germany, led a team in the investigation of 20 chimps and 32 dogs presented with the same task: retrieving an object the experimenter wanted, as indicated by the experimenter pointing. 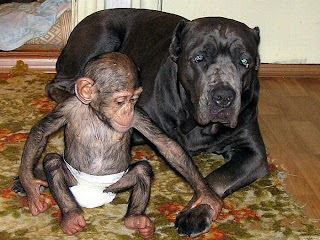 The researchers found that the dogs performed well, but the chimps failed to identify the object of interest. These results emphasize the difference in chimp response to human gaze, which they have been shown to be good at following, versus gestures.